My front porch get’s direct sunlight most of the day and during the summer months can reach a temperature similar to the surface of the sun. Add to that my lack of gardening skills (it’s not so much lack of skill as lack of patience) and the result is a beautiful pot garden of succulents. I actually love succulents. Not only are they pretty and hearty they seem … well … succulent. 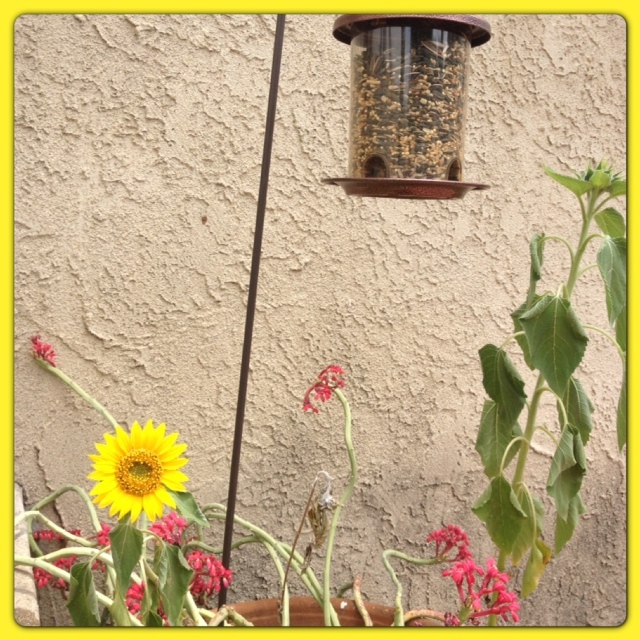 I have a bird feeder stuck in the biggest flower-pot. It’s been there for years and I fill it up with food for the birds to come snack on. 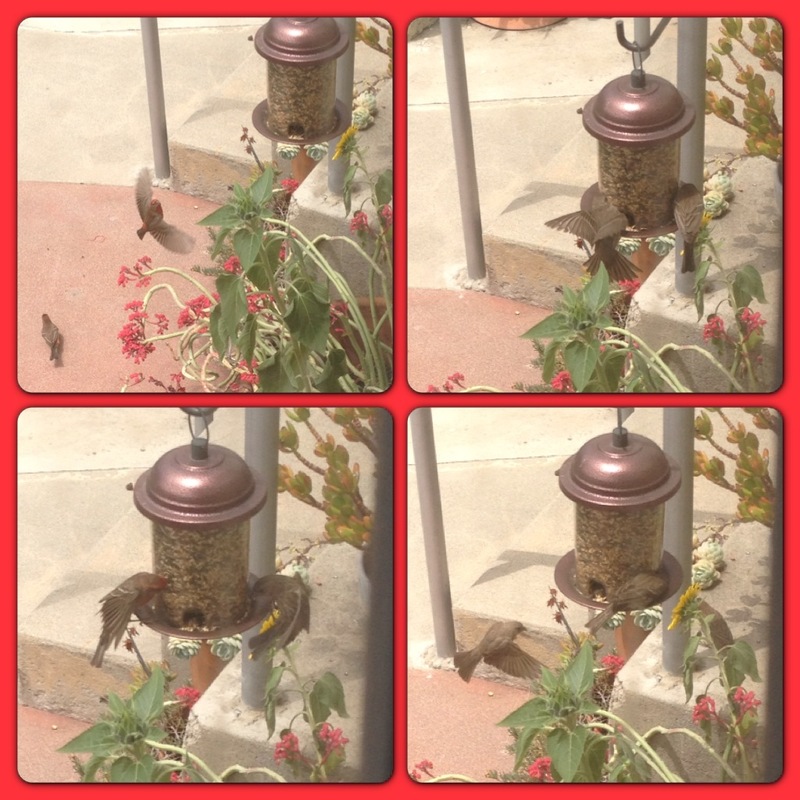 The thing about bird feeders is it takes awhile for our feathered friends to find them but once they do BACK OFF! They won’t stop eating until every last seed is gobbled up. My front porch is a 24 hour smorgasbord for a gaggle of beautiful red-headed/breasted birdies. These birds will feast through wind, rain, and sun. They don’t flinch when Riggins sits just a couple of feet from them behind the screen door barking up a storm (not at them … they’ve made peace with each other). They use to scatter when I drove up or down the driveway until one brave chick (I assume based on her gumption and grit she is female) decided to take a stand and continued to peck away only glancing up for a second, looking at me from the corner of her eye as if to say, “keep on driving lady … there is nothing to see here.” Now most stay put when I go by. I’m not seen as a big enough threat to stop their non-stop meal. Years ago I discovered if I purchased the right kind of food and placed the bird feeder just so, many of the seeds that don’t quite make it into a birds stomach will fall into the big planter. It now has a constant mulch of seed shells. If all the stars align then one or two sunflower seeds will drop down and then bloom into gorgeous sunflowers. Sunflowers are the biggest and best of all the flowers and I love that they are planted by the birds so I don’t have to even work at it! I remember the first year this happened. The sunflower was HUGE. It was later in the summer, I remember because my cleaning lady (moment of silence for the fact that I am forced to clean my own house right now during my unemployment phase) would bring her son with her on cleaning day. He would plop himself in front of my TV and let me know which of the many children TV channels he would like to spend his morning watching. Once we met outside and he admired the big yellow flower. I explained how the birds had planted it, which he didn’t believe. We spent some time picking through the uneaten bird food to find a handful of sunflower seeds that we put in a bag then into his pocket so he could plant them when he got home. Sunflowers make everyone happy! Right now I have one tiny sunflower and one bigger one on its way. The touch of beauty is the birds “thank you” for my feeding them!